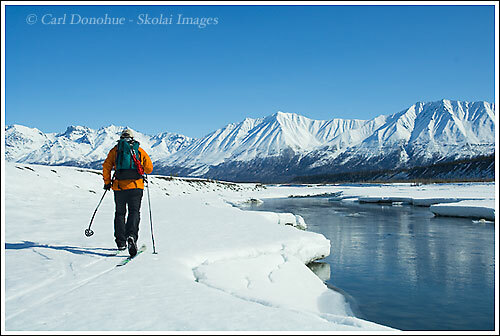 Cross Country skiing this spring along the Kennecott River. This is why they call this time of year (April) “breakup”. This spring was probably some of the funnest times I’ve had in a long time. What a great time and place! You might notice my hip new Karhu 10th Mountain XCD backcountry skis. All I can say about ’em is these skis ROCK!!! One thing that’s interesting to note here is the river; within a few weeks of this breakup, the river turns to a raging, roaring brown mess, and remain that way for all of the summer. Most of the water is glacial melt, so it is full of finely ground glacial silt, which turns the water into a dense brown color. The clear water here becomes a faded, almost impossible memory until well after summer, when the cooler weather slows the melt down, and the water returns to a clear aqua. Possibly the only thing cooler than this change is what happens at “freeze-up”, in Nov/Dec. The water, for some reason, freezes from the bottom up; standing above it you can see ice formed underneath the surface, over the rocks along the bottom, while the clear blue water rushes above. Pretty mad stuff. This entry was posted in Adventures, Alaska, Landscapes, Skiing, Winter, Wrangell - St. Elias National Park and tagged cross country, cross country skiing, Kennecott, Kennecott River, Kennicott River, McCarthy, outdoors, People, Rivers, Skiing, snow, Winter, Wrangell - St. Elias National Park, Wrangell St. Elias, XC skiing on May 28, 2009 by Carl D.
Great image, Carl, and looks like the perfect day for XC skiing. Thanks again for mentioning me in your previous blog post! Great image Carl. I’m sure that will sell as stock! You’re welcome man, and thank you for everything. Hey Dan, Thanks man. I sure hope it does. Hard to believe that is the Kennecott River! Nice jacket.